1.) 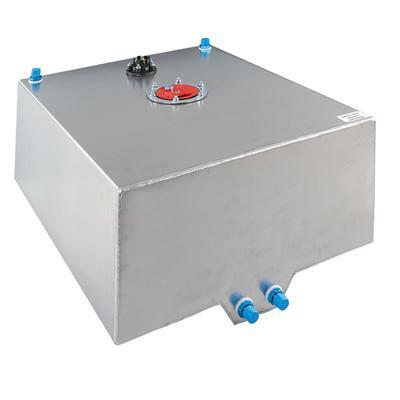 Internally regulated to about 7psi, no separate pressure regulator needed. 2.) Puts out 14 psi and requires a dead head type pressure regulator. 3.) 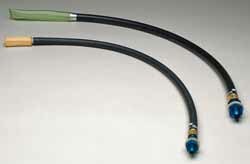 Puts out at least 14 psi and requires a return style pressure regulator. 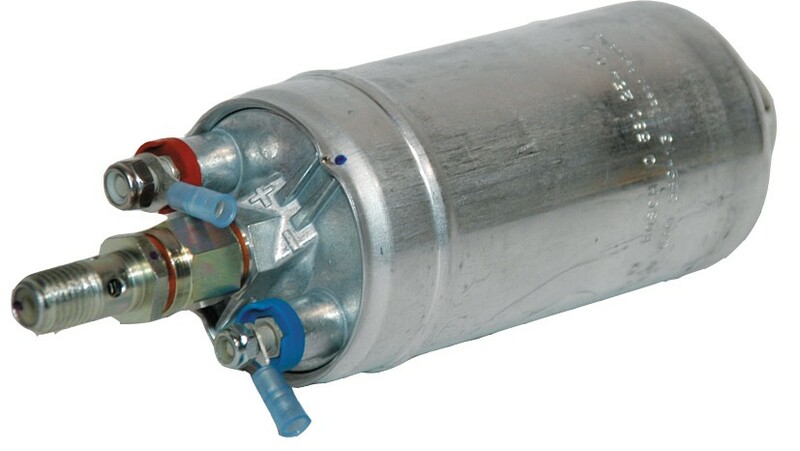 Can all 3 styles of electric fuel pumps be used with a return style pressure regulator ??? not only is the answer YES they can, the answer should be yes they should be, because only a return style regulator can maintain the consistent 5psi-6 psi most carburetors work best with. 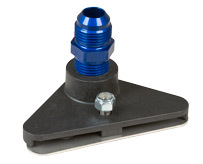 Grumpy, whats your thoughts on using swagelok fittings in fuel line builds? Seems like an valid option for those of us who aren't tubing flaring experts. Ive found that if I carefully measure the length and diameter of any fuel lines, transmission fluid cooler lines or oil coolant lines , I need and have the local HYDRAULIC SUPPLY fabricate exactly what I need with the correct swagged ends. I usually specify AN#8 and of course depending on the application, you let them know exactly what you intend to use the fluid transmission lines for, for something like fuel, you obviously would specify the lines for fuel, and able to handle at least 120 psi. for hot transmission lines I specify 300 psi and 350 F temp range. Ive always been rather amazed at the number of guys that want to build a 600hp-800hp big block or turbo small block engine, who tend to think the stock fuel lines, fuel pump and fuel tank can keep up with the new higher flow rate demands required. 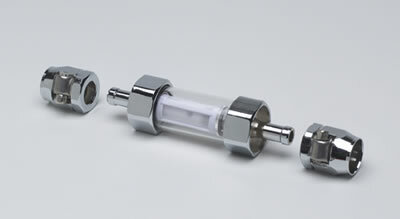 OR guys that see the need for larger fuel lines and fuel pump but connect those components to the stock un,modified fuel tank and internal fuel pick-up. the result I usually see, with guys who do that is a car that runs fairly decent until about the top end of second gear and then leans out, because the fuel system can,t come close to filling the new higher flow requirements. Most electric fuel pumps PUSH fuel fairly well, but will stall or not feed fuel easily if even slightly restricted on the intake port side, at some point (usually at or near 500- 550 hp) the stock fuel lines , even with a new high pressure fuel pump and larger fuel lines just won,t work if you retain the stock tank and fuel tank pick-up. 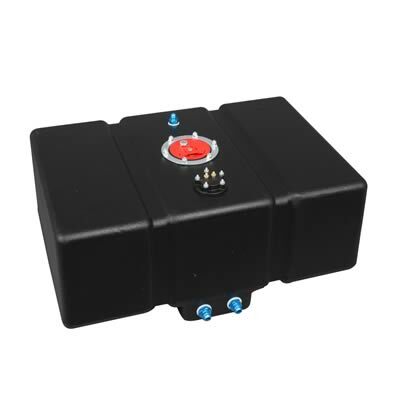 at some point your forced to upgrade from the stock fuel lines that rarely exceed 3/8" to performance application 1/2" or AN#8 fuel lines OR larger and compatible tank fuel pump and fuel lines, that should support up to about 800 plus hp, over that you might need AN#10 lines and components. 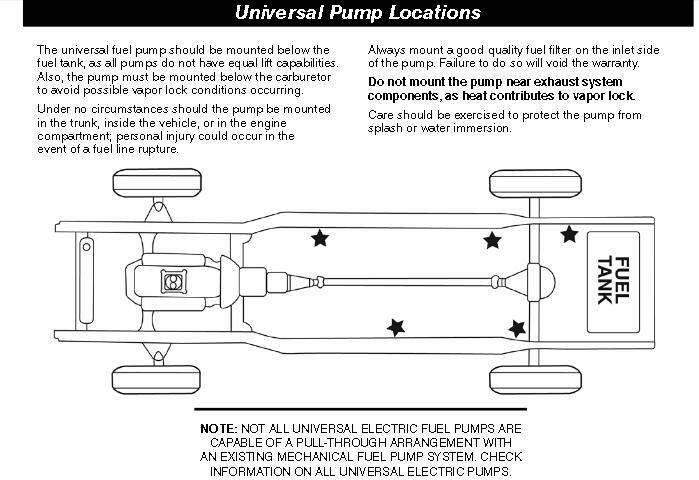 in tank electric fuel pumps REQUIRE fuel sloshing over the pump to keep it cool, obviously the ideal pump installed location will require a lower sump, to keep the pump submerged in a partly filled tank, EXTERNAL electric fuel pumps will occasionally fail to prime if the pump is not mounted lower than the tank floor pick-up height. Admittedly a scary title, something every racer should ensure is an adequate fuel system. Sometimes simple things stand in the way of glory and fuel delivery can be the gremlin before the finish line. Here at our tech support office we receive a number of calls each day varying in complexity and nature. One repeating call seems to revolve around a car that seems to "nose over" before the stripe every pass. After running through fuel pressure and ignition parameters it is often determined that the customer might not have a fuel pump that is up to the task and fuel bowls become empty when it counts. Though this problem can mask itself in several variations, having the right pump and regulator will eliminate a lot of potential issues. 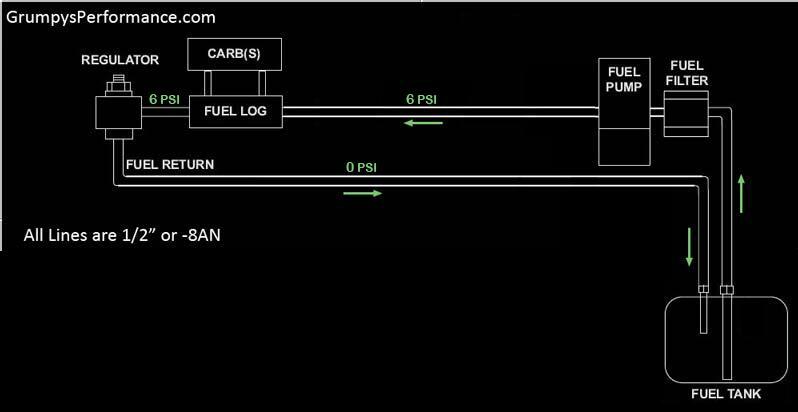 Fuel delivery has several key factors affecting it. One factor that determines total fuel flow is lateral acceleration. 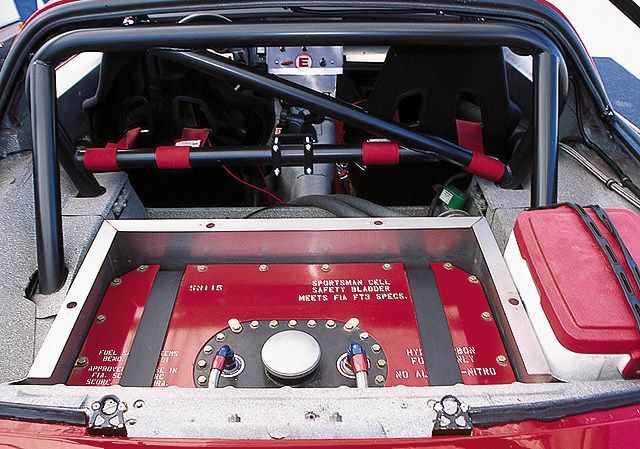 Most racers mount fuel cells and pumps in the back of their car; this configuration requires the pump to "overcome" the force of acceleration that the car is producing in its pursuit of E.T. One "g" (32 feet / Sec2) will require roughly 10 P.S.I. of pressure to push fuel forward in the line. A larger fuel line means more there will be more fuel in line which is more weight and in turn requires more pressure to move forward - you can see where this is going by now. Modern race engines making the horsepower numbers we see in drag racing today have the potential to be severely underfed by the fuel system. So if more is better then why not get the biggest pump and turn it all the way up? Have you ever heard the phrase "Too much of a good thing can be a bad thing"? What's true in most cases proves true in the world of fuel pumps. Increased fuel pressure is generally misconceived as increased volume, in fact it is the exact opposite. Excess fuel pressure means there is more amperage draw on the pump. 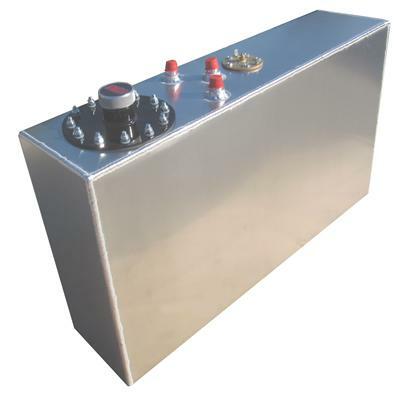 Higher amperage draws will heat a pump up and lead to cavitation which shortens the life of a pump. 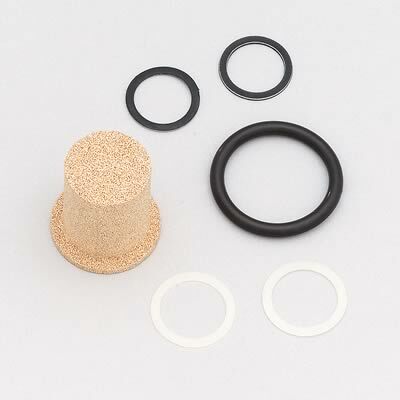 Cavitation usually goes undetected and can leave you stranded between rounds with failed fuel pump. The lesson here is that a modern fuel pump does not have to operate at maximum output to meet the demands of most racing engines except in extreme cases. Our advice to the customer is to use the recommended pressure provided by the manufacturer of your particular fuel pump. Put simply, more float control leads to a more stable fuel system. 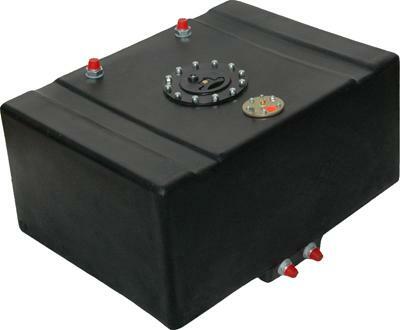 A carburetor that can sense and react to variations in fuel level will always be first to the finish line; combine this with a pump and regulator setup that can get the fuel forward and you have a winning fuel system. " Lots of GREAT info here !! Exactly what I was looking for. My Vette build is a '78 which was originally an L-48 small block. Since my particular model Vette was not one of the collectables I decided I wanted a street rod instead of originality . I am about ready to drop the body back on the frame and am at the point where I need to install the fuel lines. My plan is a big block for my build so I want to plan for high horsepower and if I end up with medium high HP, I will have plenty of fuel feed. After asking around with friends who build track cars, I came to the conclusion that 1/2 inch lines is what I want to go with. My Vette is not really going to be a track car, just a street bruiser. Here is what I want to go with; 1/2 inch stainless steel lines. I have located an industrial supply that has many versions of SS tubes. The one question I have right now is what wall thickness should I use? 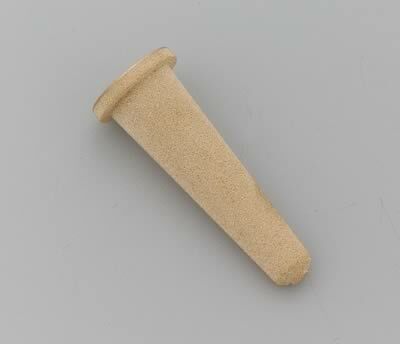 Keep in mind, the thicker the wall, the more difficult it will be to bend and fit. but Id suggest a .028-.030 minimum wall thickness, and if you don,t plan on exceeding 500hp the 3/8" line will work ok.
Lots of really good info!! I need to take the time tonight to go through it all so I can digest it. Main reason I want to go 1/2 is to leave my HP options open for later on. I will seriously consider the 3/8 however. 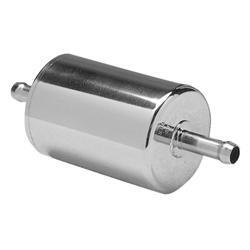 read the details carefully when you buy a fuel filter, rated pressure, fuel flow rates, and fuel line sizes are all important in making your selection. 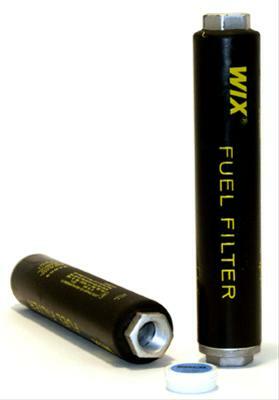 from an engineering stand point a AN#6 fuel filter rated at 130 gph at 75 psi ( linked above ) is likely to flow CONSIDERABLY less than the rated 130 gph fed by a 9-11 psi feed from a manual fuel pump,how much less obviously will be dependent on the filter medium and its surface area, and how long its been in use. 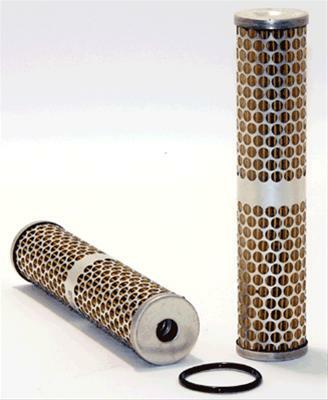 sintered bronze inserts used as filters are noted for clogging up fairly quickly, as the total surface area is not that great. working through the links included in this wealth of information on the century performance wed site linked here they recommend two regulators for what they call the best fuel system setup for drag racing. The first regulator is a bypass regulator followed by a dead head regulator to the carb. This is the first time I've seen this (not sure how I missed it as I have been reading through this thread a bunch) and was wondering your thoughts on this one. I figured this is the reason for mounting the regulator as close to the carb as possible and have the regulator after the fuel log. What would be the purpose of the second regulator? legerwn wrote: working through the links included in this wealth of information on the century performance wed site linked here they recommend two regulators for what they call the best fuel system setup for drag racing. The first regulator is a bypass regulator followed by a dead head regulator to the carb. it theory it would tend to stabilize the fuel pressure at the carb inlet port, in practice Ive NEVER seen it do more than make a bit more restricted and expensive, a good high quality return style fuel pressure regulator ,matched to the correct line size for the application is fully capable of consistently delivering fuel at a relatively constant pressure. 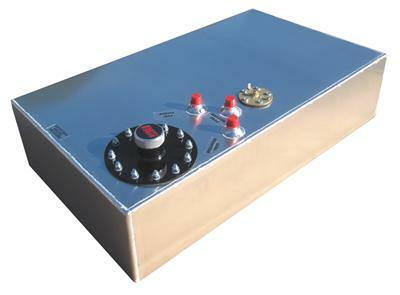 Grumpy what is your opinion on the Gm style short return rear regulator fuel system. Where the regulator is rear and it has a short return line to the tank. I for get the book it was mentioned in but it raised my eyebrow a little bit.